Whether you'd rather keep your Christmas music from cluttering up your library for half the year, or you need iPod-friendly tracks alongside your lossless ones, you can make your life easier by splitting your music into two separate libraries. Here's how. I recently ripped some of my music in lossless format, but since my MP3 player doesn't play the lossless format, and my favourite media programs don't encode music on-the-fly when I sync to my MP3 player, I still needed both high (the lossless) and low (MP3-player friendly) bitrate versions of all those songs. Unfortunately, this creates a lot of duplicates in my library, making it much harder to sift through. So, I separated my music into two "libraries" within the library: one containing the lossless files of those albums, and one with all low bitrate versions. Of course, separating your music by bitrate isn't the only reason one might want to manage multiple libraries: maybe you listen to Christmas music for a couple of months out of the year but not the rest, or maybe you just find that your enormous classical collection makes your pop library feel cluttered. Whatever the case, it can be hard to have all your music thrown into one hodgepodge of a library, as most programs do by default. If you think you might benefit from splitting things up, here are a few options for keeping your music libraries separated and organised, no matter what platform, program or portable MP3 player you have. The examples below will use bitrate as the variable, but you can easily tweak any of these methods for your own situation. Most music players store library data in a file or folder somewhere on your computer, and you can usually work around this file to create two music libraries, choosing which one you use when you launch the program. However, this method is also, in my opinion, the most inconvenient long term, since you actually end up managing two completely separate libraries. Alternatively, you could use separate players for each library — i.e. use iTunes for the library you want to sync to your iPod and MediaMonkey for the library containing lossless files — but that carries with it the same downsides. To use multiple library files in iTunes, just hold the Shift key (or Option key if you're on a Mac) while launching iTunes. It will give you a dialog box asking you to create or choose a library. 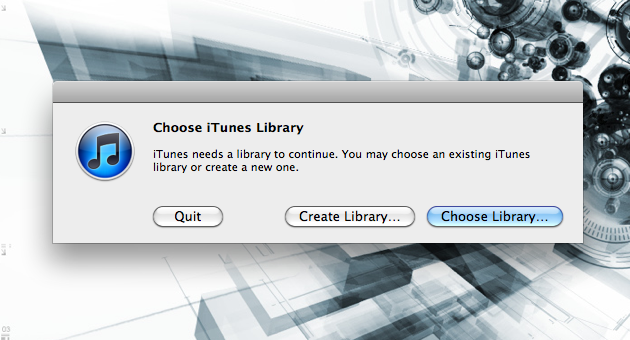 If you create a second library, you can easily switch between it and your original library by holding Shift/Option when starting up iTunes to choose between them. Other players may not have the same options built in, but you can usually still use multiple library files, it'll just be a little more hackish (see methods for foobar2000 and MediaMonkey, for example). The problem with this method is that you literally have to manage two completely separate libraries. In my bitrate example, any time you add music to one, you need to remember to add it to the other, and any time you create a playlist on one, you need to remember to create it on the other. The two can get pretty easily fragmented, and after a little while it may become more trouble than its worth. This method works best if your libraries are in fact completely separate — i.e. one contains only low bitrate files and the other lossless, or one is your usual music library while the other is solely Christmas music. If the two libraries overlap at all (say, if you only rip some of your music in lossless), you'll have to use the slightly more workaround-y option two. While every player is different, most allow you to filter your music in a number of different ways into Smart Playlists, or at least to show or hide files with a certain criteria. With this ability, you can keep all your music in one library, but only show certain files at a time, thus eliminating the clutter (in this case, "hiding" the lossy versions when I'm just listening, and hiding the lossless versions when I'm synicng my MP3 player). The procedure is slightly different depending on the type of desktop player you're using. There are a few different ways to do this, and while your situation may allow for a fully automated solution, our example does not. We essentially want to divide our library up into two different versions: one containing some lossless files and one in which all files are low bitrate. Note that in this example, we don't have every album in lossless format, just some of them. What we're going to do is essentially create two smart playlists, each acting as a separate music library: one will contain all of our music in low bitrate format, while one will be a mix of low and high bitrate files. We essentially are just making sure there are no duplicates in either "library". While our "iPod-friendly" library is extremely simple to create — just make a smart playlist that excludes high-bitrate files (see above) — the "mixed" library is a bit more difficult. We can't easily automate a playlist to check for lossless files and then add the lossy versions, so we need to manually tell our music program which songs are low-bitrate duplicates of our lossless tracks. THe easiest way to do so is to use the multi-purpose "Comments" section: just round up all your lossy duplicates and add something in the comments section to tag them (I just add the word "lossy"). Now, you can just create a smart playlist for songs whose comment section does not contain the word "lossy", and you're in business. From now on, instead of hitting "Music" to view your entire library, just hit one of the smart playlists. Note that some players, like Winamp, allow you to create "Smart Views" instead of smart playlists — the process isn't any different; it just makes it feel like less of a workaround, since it shows up as a music library instead of a playlist. In Amarok, you can use their handy filter editor, but some programs (like foobar2000) require you to type in the filter yourself. This method, while very similar to the smart playlist method, has one minor drawback: you may have to retype or reapply the filter every time you want to switch libraries. It's not that big of a deal, but if your player doesn't save recent filters (like Amarok does), it just means it takes a bit more than one click to move to a different library. These aren't necessarily perfect solutions, nor are they the most user-friendly. However, if you find that your music library has too much clutter in it, you may be best cleaning it out by managing a few different "libraries" at a time. Furthermore, separating your library by bitrate is only one example of when this might be necessary. If you use multiple libraries (or you think you need to), let us know your solutions for organising your media in the comments. "Any" seems to omit the world's most ubiquitous media player: Windows Media Player. Unfortunately that one has gone from bad to worse. Whereas you could once upon a time manage multiple libraries by some jiggery-pokery with the index file, now the awful integration with Windows 7 libraries means that have to tolerate WMP also mangling your image files. I would like to point out that in iTunes, the file type is listed as "Kind". So when creating a smart playlist, you can easily automate the splitting of your library into lossy and lossless based on the file type. "Kind contains Apple Lossless", etc. for a lossless smart playlist. With MP3 files, you need to use "Kind contains/is MPEG Audio File". Thus, you can easily automate a playlist to check for lossless files. I want to do something like this with playlists. Instead of one directory for playlists, i want more and that are customizable, for example by genres. Is That possible?